WE SUPPORT OUR TROOPS AND COUNTRY. THE ARTIST - JOHN PAUL STRAIN Artist John Paul Strain captures the color, drama and heroism of the Civil War with a vivid realism that is unique among the nation's top-ranking historical artists. A native Southerner born in Nashville, Tennessee, John Paul Strain has studied American History and the War Between the States in particular practically all of his life. He received his formal training at BYU, polished his professional techniques as an illustrator for the U. Department of Energy, and soon afterwards entered the field of historical fine art, prints and posters. His distinctive artistic style, which combines bright colors and contrasting shadows, and his devotion to historic authenticity have dramatically increased his popularity. Today, his original art is displayed throughout America and among collectors of fine art limited-edition Civil War prints. Artist John Paul Strain has become an American favorite. John Paul Strain S/N Limited E dition Print "Sunday in Winchester". And Anna Jackson with the Graham Family. Kent Street Presbyterian Church - February 2, 1862 It was a stormy Sunday in Winchester on February 2, 1862 in many ways. Three days earlier General Stonewall Jackson had resigned from service from the Army of the Confederate States of America. His letter to Secretary of War J. Benjamin stated, With such interference in my command I cannot expect to be of much service in the field; and accordingly respectfully request to be ordered to report for duty to the Superintendent of the Virginia Military Institute at Lexington; as has been done in the case of other Professors. Should this application not be granted, I respectfully request that the President will accept my resignation from the Army. The word of Stonewall's resignation spread like wildfire across Virginia. The populous was in an uproar, soldiers under Jackson's command were stunned, and there was a hornet's nest of activity in the Confederate capital of Richmond about what to do. General Jackson however was calm and introspective, praying several times a day for guidance and intervention. General Jackson, his wife Anna, and the Graham family attended services at the Kent Street Presbyterian Church where his friend Reverend James R.
The Jacksons were guests in the Graham home during that winter and they had become part of the family. Family life with the Grahams and their three young children was appreciated by the Jacksons. Time spent with Anna in the winter months brought happiness to the General during days of military challenges and trials. Anna would become pregnant that month with their only child. Arriving at church from a carriage ride in the snow, Anna helped three year old Alfred Graham from his seat. The General had a special affection for Alfred. Before the snowy weather had passed, President Jefferson Davis had sent an envoy to plead with General Jackson not to resign. The Confederate high command had learned an important lesson on how to handle Generals in the field. General Jackson withdrew his resignation. Attending church services three weeks later, General Jackson was asked to give the closing prayer. The General rose to his feet, bowed his head, folded his arms, and in a powerful voice that filled the sanctuary, prayed. O Lord, God of Hosts, prevent, we beseech thee, the effusion of blood; but if we must fight, give us the victory. Also available in these formats. Remarques on Lithographic Artist's Proof Print Edition Only. All Limited Edition prints are signed and numbered (S/N) by the artist and include a Certificate of Authenticity. Limited Edition prints are restricted to a certain number. For example, if 400 prints are made from an original painting, once theyre gone, thats it. There is no limit to the number of open edition prints of a particular painting. Thats why Limited Edition prints are more expensive and more valuable to collectors than "open" edition. Rare objects are more valuable. An Artists Proof (AP), generally, is the first 10% of the Limited Edition prints that come off the press. If the Limited Edition is 400 s/n, there would be 40 APs. This status is noted on the print. Collectors prefer APs because their value increases even more than a Limited Edition as time goes by. A remarque is a pencil drawing done in the white border area of an art print. The subject of the remarque is usually determined by the artist. Each remarque is a piece of original art which adds to the value of the print by making that particular print unique and exclusive from the rest of the prints in the edition. All Limited Edition artwork is subject to availability at time of order. 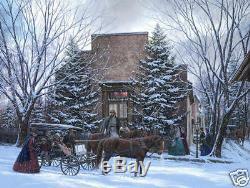 The item "Sunday in Winchester John Paul Strain Civil War Print Stonewall Jackson" is in sale since Thursday, February 18, 2010.